Coconut milk and curry powder make this oven braised chicken juicy and tender, and it's packed with flavor. 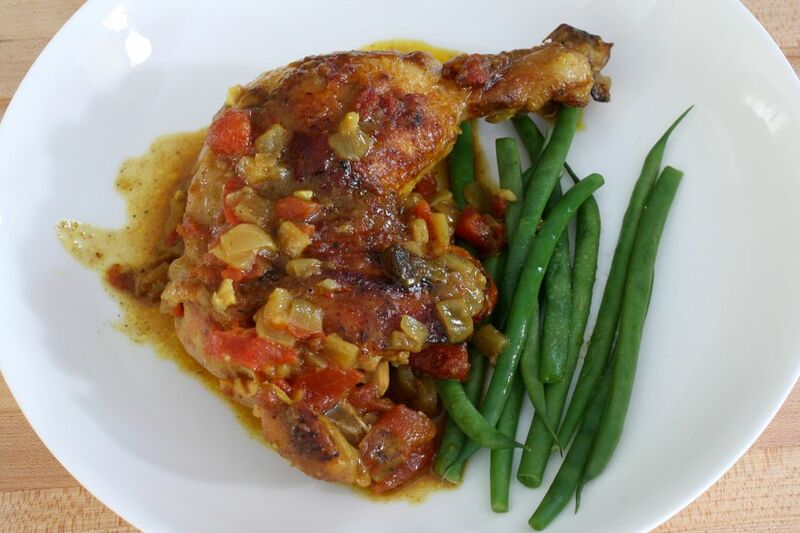 I used whole chicken legs in this dish, but chicken thighs or a combination of drumsticks and thighs could be used as well. Feel free to adjust the cayenne pepper if you like more or less heat. Serve the chicken over creamy grits or rice, or serve with potatoes and a side vegetable. Heat the oil in a large Dutch oven over medium heat. Put half of the chicken pieces in the Dutch oven and cook for about 5 to 6 minutes on each side, until golden brown. Remove the chicken to a plate and repeat with the remaining chicken. Remove the chicken to the plate. Add the onion to the Dutch oven; cook, stirring until lightly browned. Add the garlic and ginger and cook, stirring, for 2 minutes. Stir in the curry powder, cumin, cayenne pepper, and remaining kosher salt. Cook, stirring, for 1 minute. Heat the oven to 300° F.
Stir in the tomatoes and coconut milk. Bring to a boil and add the chicken pieces. At this point, if your Dutch oven or cooking pot is not oven safe, transfer the chicken mixture to an oven safe baking dish or pot. Put the pot in the oven and cook, uncovered, for about 1 1/2 to 2 hours, until the chicken is very tender. The chicken should register at least 165° F on a food thermometer inserted into the thickest part of the chicken, not touching bone. Skim the fat from the juices, if desired. Stir in cilantro, if using, and serve with the chicken and rice or creamy cooked grits.